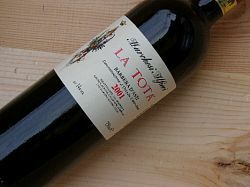 The 2001 Barbera d’Asti La Totta has taken a large leap in quality in 2001 due to the systematic crop-thinning undertaken for the first time. Plummy and chocolaty on the nose, smooth, ample, and long on the palate, its fresh acidity keeps up the momentum and vigor without unbalancing the wine. Anticipated maturity: 2004-2007. The 2001 Barbera d’Asti Alfiera, like its predecessors, is one of the top wines in the appellation. Dark ruby, very sweet and tarry with jammy berry fruit and mocha notes, it is sizeable in flavor, warm, supple, very ripe, and with excellent oak spices which add complexity. Anticipated maturity: 2004-2009.